As data-based strategy collides with customer engagement, baseball considers whether analytics helps the game or potentially harms it. Supporters of the shift believe it’s a solid baseball strategy. By overloading defenders to the side of the field where a hitter routinely drives the ball, teams should get outs more easily. When to deploy the shift is a game of numbers. It depends on the likelihood of the batter to hit the ball one direction or the other, given his tendencies and the circumstances on the field. It’s analytical thinking in all its glory. And yet there is a growing legion of shift haters. The drumbeat of those who blame the shift not just for reducing hits, but for increasing strikeouts, robbing the game of excitement, and any number of other sins grows louder by the day. So what would happen if the shift was banned? That’s the question legendary baseball writer Jayson Stark set out to investigate. He joined us to share his findings. Paul Michelman: When Joe Maddon entered his first season as the manager of the Tampa Bay Devil Rays in 2006, he had a Big Papi-size problem to deal with: Red Sox slugger David Ortiz had been using St. Petersburg – and the entire league – as his personal offensive playground for the past several seasons with no signs of letting up. The left-handed Ortiz was a notorious pull hitter, lacing liners to the right side of the field with so much success that teams began to place three infielders on that side to try to slow him down. But Maddon was ready to go one step further. He began positioning not just three infielders on the right, but all three outfielders as well, leaving the third baseman alone to cover the left side of the diamond. With Ortiz unable to convert himself into a spray hitter on the fly, he found himself frequently stymied by Maddon’s defensive wall. We don’t have a ready count of just how many hits Ortiz lost to Joe Maddon’s creativity, but the rest of the league certainly took notice. Ben Shields: Fast-forward a dozen years and it’s clear that a shift revolution has taken hold of Major League Baseball. More than 30,000 defensive shifts took place in the 2018 season alone. That’s more than once in every five at bats. And what became of the duel between Ortiz and Maddon? Although he would later say that shifts had taken 500 hits away from him, Big Papi managed to remain a dominant force in the game for another decade, while demonstrating hundreds of times over one of the things the shift can’t take away – a home run. So, what about Maddon? After taking over as manager of the Cubs in 2015, his teams have ranked near the bottom of the league in shifts. Did he recognize that the shift might have hit peak bubble? Well, in 2016, while downplaying the very strategy he helped popularize, Maddon led the North Side’s lovable losers to their first World Series championship in 108 years. I’m Ben Shields. 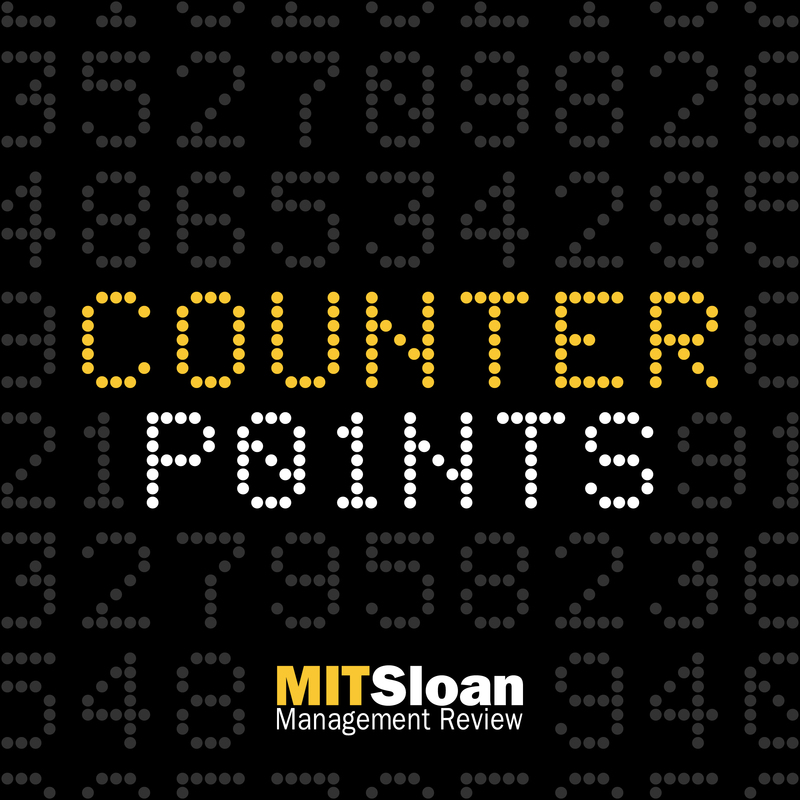 Paul Michelman: I’m Paul Michelman, and this is Counterpoints , the sports analytics podcast from MIT Sloan Management Review . In this episode: What would happen if baseball outlawed the shift? Ben Shields: Supporters of the shift believe it is a solid baseball strategy. By overloading defenders to the side of the field where a particular hitter routinely drives the ball, teams should get outs more easily. When to deploy the shift is a game of numbers. It depends on the likelihood of the batter to hit the ball one direction or the other, given his tendencies and the circumstances on the field. Decisions regarding the shift represent analytical thinking in all its glory. Paul Michelman: And yet there is a growing legion of shift haters. The drumbeat of those who blame the shift, not just for reducing hits, but for increasing strikeouts, robbing the game of excitement, and any number of other sins, grows louder by the day. In short, there are plenty who believe the shift is ruining baseball. But how much of the game’s recent evolution is really due to the shift? And what might actually happen if it was banned? Those are the questions Jayson Stark set out to investigate. The 2019 J.G. Taylor Spink Award winner, Stark is currently a columnist for The Athletic and appears on MLB Network and Stadium TV. He joined us to dig into baseball’s big question of the day: What would happen if Major League Baseball outlawed the shift? Jayson, thanks for joining the show today. Jayson Stark: Well, thank you guys for having me. Paul Michelman: So, let’s begin at the beginning. Talk to us about the strategy behind the shift and its recent history in Major League Baseball. Jayson Stark: Yeah, the shift didn’t exactly start last week. You can dig up all over the internet really cool black-and-white photos of Ted Williams hitting against the shift 60, 70 years ago and, you know, it’s appeared intermittently ever since. It’s just over the last 10 years, and really the last five years, [that it’s] exploded. And, why is that? Because there’s so much more information in the game. And you’ve got front offices that just can’t get enough of it. So here is how the shift has changed. There were 8,000 more shifts on balls in play in this past season than there were the year before – 8,000 more. If we look over the last five years, there were 28,000 more shifts than five years ago. That’s an astounding number. All right, so why is that happening? Because of data. It’s pure science. It’s such a simple concept. I remember arguing with Barry Bonds 10 years ago. He was trying to tell me, “Ah, this shift don’t work, man.” And I said, “Of course it works!” Here’s the deal: Because of the data, if you’re the defense and you’re the pitcher and you’re the coaching staff, you know if we throw you this pitch in this spot, maybe even in this count, we know exactly where you’re going to hit it. So guess what? We’re going to have somebody standing there. That explains the shift. It’s just the baseball equivalent of: It’s third and one in the NFL, there’s going to be 10 defenders in the box because you’re probably going to run. It’s the same thing. Ben Shields: Well, Jayson, it sounds like the shift at the highest level is an interesting strategy in baseball. But, we also know that quite a few people in the game, both fans and in the league, view it as a problem. Can you explain to us why the shift is seen as a problem? Jayson Stark: Well, I think the big-picture reason is – if you’re going to ask Rob Manfred, inject him with truth serum and [ask], “What’s the biggest problem in your sport right now?” The big-picture answer would be, you know, we’re reaching this tipping point between what makes great baseball strategy based on information versus what makes great entertainment strategy based on what people who are sitting there in the seats would love to see. And I would say that if you’re going to define what he would like to do with his sport, he would like to see the game have better rhythm (which has nothing to do with the shift, really), and see the game have more action. And “more action” you could roughly translate to “more people running around the bases, more balls in play.” And why do they think the shift has an impact on both of those? Well, let’s talk about the running around the bases part. If you just look at the pure data, the single is now all of a sudden an endangered species. There were fewer singles this year than in any season in this millennium. Singles are down 3,000 – 3,000 fewer singles than 10 years ago. And singles aren’t what they used to be, but when somebody hits a single, he’s running around the bases. We’re looking for more of that. That’s the whole theory coming from the commissioner’s office – we need more action. And then the other part of it is more balls in play. I think this is probably the biggest question I get from people: If you’re trying to increase the number of balls in play, why would you attack a strategy that’s designed only for balls that are already in play? And I think the answer is [that] there is this theory within the commissioner’s office, within the competition committee: What have hitters been coached to do to combat the shift? You would think they would be coached to just hit the ball where nobody’s standing – try to hit it through that big hole on the other side. But that’s not really the case. What they’ve really been coached to do is hit the ball over the shift. It’s where the launch angle revolution has come from in great part. How have pitchers combated that? If you’ve got one hitter after another marching up to the plate with an uppercut swing, the answer from these pitchers is to start throwing their 97-mph four-seam fastball over those bats. And when uppercut swings meet those 97-mph four-seam fastballs, you know what you get? More swingin’ and missin’ than you’ve ever seen. I think that’s the theory and why limiting shifts could help all of that theoretically. Paul Michelman: What would a rule banning the shift actually look like in practice? Are players going to be in some kind of box that they can’t move from? Jayson Stark: You have two potential options. One idea is that we’re going to limit it to having two infielders on the left side of second base and two infielders on the right side of second base. That’s really simple. Combat the shift one on one. Or, there’s another variation which would make a lot of left-handed hitters happy. You know those guys who hit that line drive over the second baseman and think they got a hit, but the third baseman’s standing out 50 feet in right field and throws him out. They would love to see a rule that says infielders have to stand in the infield, they can’t be on the outfield dirt. And so, you could do both of those or you could do one or the other. But then, like I’ve already had coaching staffs ask me, how are we defining infielder? Good question. Ben Shields: Yeah, that seems to be another layer of complexity to this whole issue, Jayson. So, I want to get to this question: Is there any data that you are aware of about understanding how removing the shift will impact the game? Do we have a sense of what the reward or risks would be? Jayson Stark: Yeah, right now, nobody is doing more to track shifts than Sports Info Solutions, which I’m sure you guys are familiar with. People who read that Bill James Handbook every year or go to Bill James Online [know] he’s affiliated with Sports Info Solutions. And so, they track shifts. They track what happens every time a ball is hit into a shift. I asked them to do some research for me. So they looked at last season and they looked at the last three seasons and tried to track the difference between what has happened when a team was in a full shift and then either a ground ball or a short line drive was hit into that full shift, versus what would happen if the same ground ball or the same short line drive had been hit against a team that was not playing a full shift that would probably be playing a defense where the second baseman or the shortstop would be playing like an inch-and-a-half to the other side of the bag, so he wouldn’t be hauled into court and accused of violating the shift rule. And the results were really interesting. You would see, if they just did that, a 50-point jump in batting average on ground balls and short line drives that are pulled into the shift – 50 points! That sounds very impressive, right? But here’s the other side of that: It comes to only about 500 more hits per season. And most of those hits are singles. And the reason for that is while it seems like every time you look up a team is shifting and they’re shifting on every hitter, that’s not really the case. There’s really only a shift on about 20% of all player appearances. So that means every inning at least one hitter’s getting shifted on and the shift is having a major impact, certainly on left-handed hitters. But in terms of the totality of the game, 500 hits by the entire sport over the entire season is not a lot of hits. But here’s the other side of this: We’ve got that data, and we show that removing the shift would produce more hits. But the other side of it is we can’t examine that data in a vacuum. One of the people I talked to for the piece I wrote about it was Joe Maddon, who is the manager of the Cubs. And he gave me this example: Imagine the difference between when a hitter hits a ground ball into the shift when there’s a man on first and nobody out. What happens when you do that? It’s a double play! Okay, but now let’s consider the difference between that same ground ball into no shift. What do you got? You’ve got first and third. So, think about the difference: two outs, nobody on, versus first and third, nobody out – that’s a huge difference. Everything changes because of situations in baseball. So, we don’t know what the impact of that alone would be. And then, we don’t know what the impact on mindset would be. You know, I had coaches ask me this question: How do we know that [if] that big left-handed masher comes up and there’s a man in scoring position, and there’s a big hole in the right side that didn’t used to be there – how do we know that he wouldn’t just hit a ground ball through that side when ordinarily he’d be trying to lift the ball? And maybe strike out? We don’t know what that impact is. How do we know that with two strikes, if there’s that big hole that didn’t use to be there, he wouldn’t shorten up and settle for hitting the ground ball, whereas now that’s not an option? There’s so much that we don’t know about what the impact would be of this, that it’s fascinating. So, there’s the raw data, but then there’s all the ripple effects of taking it away that nobody can possibly compute. Paul Michelman: So, Jayson, if we kind of come back to the raw data – and we love this argument because of the complexities – it’s very hard to prove causal connection here because there are so many other factors in play, as you’ve just articulated. I’m interested in kind of exploring what other factors could be contributing to changes in the game and changes in the data during the shift era. Right? What else has gone on? How much might we be attributing to the shift incorrectly or without justification? Jayson Stark: I think that comes back to two things. One is there’s just so much information now that is just crammed into every pitch of every game that affects how hitters are pitched, how hitters are defended. The pitcher and the defense now know everything about that hitter. So, you can’t underestimate that. That would not change whether you had shifts or no shifts. The second thing, and this is, I think, the biggest and most impactful change in the sport of them all, is velocity. I mean, the number of pitchers who throw 95 mph or harder now has quadrupled or quintupled over the last five years, depending on which data set you want to use. That’s an enormous change. And whereas shifts are 20% of all plate appearances, velocity is every plate appearance, as long as one of those pitchers is in the game. And what does that lead to? That’s leading to swings and misses, right? It’s leading to this incredible epidemic of strikeouts. People talk about the three true outcomes – strikeouts, homers, walks – and how that’s taking over the game and because of that... we’re now in a situation where there’s almost four minutes between each ball and play. But so much of that, really, is about the explosion in strikeouts. And nobody knows how to combat velocity. There’s no good solution without really changing the sport at its foundation. You know, you’d have to move the mound, lower the mound, raise the mound. What exactly are you going to do that would allow hitters a better chance to attack velocity? And velocity figures into the whole shift stuff, too. One of the things that you hear is the shift has been around and really prevalent for the last 10 years. And have we seen this massive uptick of hitters trying to go the other way to beat the shift? We haven’t. One of the reasons for that is velocity. It’s really difficult to do that against the intense velocity they’re seeing. So that’s the part of this that is really underestimated. Ben Shields: So, Jayson, I want to build on that and think about the current shift trend, especially with the velocity point that you just made. Have these trends been happening long enough to have impacted longer term decision-making in the game like player evaluation and development? You think about Big Papi for instance. Would we look at Big Papi differently if he were coming up through the ranks today than we would have when he first started? Jayson Stark: Well, Big Papi’s an interesting example. But you know one of the reasons he’s interesting? It’s that when he started to get shifted on massively midway through his career or maybe a little bit in the latter stages of his career, because of that he actually is one of the few left-handed sluggers who rebuilt his swing so that he could attack the shift better. But he’s probably not the right example. You know, the better example would be the Joey Gallos of the world. When I wrote my column, one of the first people who responded on Twitter was Joey Gallo himself, who said this is all I want for Christmas. Right? Because he’s dealing with all of it – shifts on almost every plate appearance, and four outfielders! He can’t hit a single! He’s had back-to-back years of more homers than singles. Nobody’s ever done that. And so, that’s the example of the guy who has really been impacted. It’s that big left-handed, pull-hitting slugger who can’t run at all. He’s got nothing in common with Tony Gwynn. Nothing in common with Vince Coleman. He can’t run, he can’t slap the ball around. All he does is go up there and try to pull a ball in the air. And it’s all he can do. And so, the one-dimensional, left-handed slugger is no longer evaluated the way he used to be. It’s a fascinating trend in the business where guys who hit 20 home runs, 30 home runs, go out into the free agent market – they used to get rich, now they can barely get a job. Paul Michelman: So, through that lens – if we did ban the shift, how many of these problems and trends we’re seeing that we’re attributing to the shift, maybe conveniently and maybe based on solid argument – what percent of those are actually going to be addressed? Jayson Stark: Wow. I’m not that smart. You may have invited me on the MIT Sloan podcast, but I am not that smart. I really think that nobody knows the answer. But, this kind of goes to the big-picture aspect of this again. If you talk to enough people within this sport about this, they admit they don’t exactly know the answer to the question that you’re asking. But you know what they’d like to do? Try it. They’d like to try it and see what happens. Because their feeling is the NFL does this all the time, the NBA does this all the time – they tweak their roles, they experiment with roles, trying to inject more offense and more action into their sport. And when it works, people love it, they keep it. When it doesn’t work, you know what they do in a few years? They try something else. We don’t have that climate within baseball. For some reason, it feels like the rules of baseball have somehow come to be sacrosanct – this religious doctrine that we should not be messing with. And everybody gets offended if you talk about messing with it. And I think that speaks to one of the biggest issues in the game. Everybody admits that baseball needs to change. They all have different theories on why it should change and how it should change, and what it should do when it changes. But the climate is such [that] you can’t make any of that change happen. And one of the big reasons that I decided to write the piece I wrote was I wanted to get the conversation started, and specifically that aspect of it. Why is it so wrong in baseball to experiment with change? Ben Shields: Well, Jayson, that will bring us to, I think, our final question for you. You’ve done a very balanced analysis of the current state of the shift. What do you think should be done with regard to the shift? Jayson Stark: I would try this: I wouldn’t limit two infielders on each side of second base only on the infield dirt, although that would create a lot more hits, I think. I wouldn’t mind experimenting with two infielders on each side of second base. You know, people ask me all the time: How can you make a rule that limits where players can stand in 165 times a game? And the answer is, again, the other sports do that all the time. In the NBA, your 7-foot-3 guy can’t camp in a lane on defense for all 24 seconds of the shot clock. He’s got to get out of there! In the NFL, they have rules about how many players can stand at the line of scrimmage on offense. Hockey and soccer have offsides about where players can stand. And so, there’s precedent for this outside the sport. I’d love to go back to the issue that I just talked about. And that is, I would like to see an atmosphere in the sport where it’s OK to experiment with different changes like this. It really doesn’t bother me if they would rather conduct those experiments in like the Arizona Fall League or the Pacific Coast League or throughout the minor leagues before they do it in the big leagues. That’s cool. That’s fine. Wherever you think is an effective laboratory, try that. But let’s get to the point where we can address potential issues in the sport and see if we can make the sport a more entertaining event, day in, day out. I’m not convinced that this fixes everything. I think they should be talking about a million different possible changes all across the board. But this should be part of that conversation, and maybe we can reach a point where you can fit a few different pieces in this puzzle together and you come out on the other end with a more entertaining game. Who is opposed to more entertainment? Anyone? Ben Shields: Definitely not us. Paul Michelman: On that, you’ve elegantly brought us back up to the wide angle. So, thank you very much Jayson Stark. This was a terrific conversation. Jayson Stark: I really enjoyed it. This is one of my favorite topics. You probably can tell, right? Paul Michelman: If you want to learn more about the shift and what might happen if baseball dropped it, check out Jayson’s article on the topic at theathletic.com. Paul Michelman: You can find us on iTunes, Google Play, Spotify, Stitcher, and wherever fine podcasts are streamed. If you enjoy Counterpoints , please take a moment to rate and review us. We will graciously accept your constructive criticism, too. How is Digitization Affecting Your Business? A short questionnaire from researchers at MIT Sloan’s Center for Information Systems Research helps assess digital risk.